We are successfully meeting the varied requirements of our clients by providing the best quality range of Single Sided PCB. We are the certified partner & offering PCBs with FR4 Grade material in this oligopolist market. we are proud & large scale manufacturers with offering FR4 Material with certified TQM (Total quality management) services. With sincerity and hard work of our experts, we have carved a niche for ourselves in this domain by manufacturing and trading Single Sided PCB. 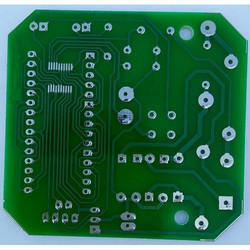 We are successfully engaged in manufacturing a wide gamut of Single Sided PCB. Keeping in mind ever-evolving requirements of our respected clients, we are offering a premium quality range of Single Sided PCB. We are counted amongst reckoned names in the industry, committed towards manufacturing a broad gamut of Single Sided PCB. Metal Core PCB with 35Micron Copper. Available in all thickness as required. Size-As per requirement. Leading PCB Manufacturer in LED Lights PCBS at Gandhinagar GIDC.